Probably the most expensive WVO filtration method to set up is centrifugal filteration - using a centrifuge or "fuge" as it's often called. If you're serious about using and filtering WVO, and if you've got several hundred pounds to spare, then a centrifuge may be just the ticket... but is it really worth it? I have produced a YouTube Video on the subject which you may find helpful. It covers the basics and also discusses typical set up. But if you enjoy reading, let's have a closer look. A centrifuge is a small device, roughly the same sort of size and shape as the average oil filter you might see on your car engine. Inside it oil is spun around very quickly, several thousndrevolutions per minute, which in turn filters waste vegetable oil (amongst other things). These are not new pieces of kit and have been around for many years (I think I read somewhere that they were used on Traction Engines), but the advent of biodiesel production in particular has led to a new use. 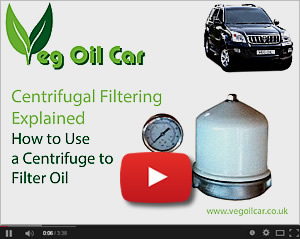 How Does A Centrifuge Filter WVO? In theory a centrifuge is like settling on steroids! Standard settling uses gravity to slowly and gently pull large impurities within WVO towards the bottom of the container, allowing the cleaner oil to float to the top. By spinning the oil, centrifuges artificially create the force of gravity - only they do so more energetically. Instead of the standard force of gravity (one g) you can create forces around 4000g or more. So, in theory, you can settle your WVO very quickly. Don't forget to check out my YouTube Video on the subject for helpful video footage and animated diagrams. The centrifuge itself has no power. It contains a central cylinder that is forced to rotate by the power of pumped oil jetting from nozzles at its base. Thus, to begin with, we need oil. Ironically the oil actually needs to be fairly clean to begin with. Any obvious animal fats should be "settled" out beforehand and the remaining oil filtered to a minimum standard of 200 microns. The oil also needs to be as runny as possible which is achieved by heating to around 50 Celsius by a heating element, like a standard immersion heater. Once hot, the oil is pumped into the centrifuge where it is spun. Fat and particles are forced to the sides of the cylinder by centrifugal force and the cleaned oil drips back into the container where it is collected and fed back through the system again. Typically the WVO is passed through the centrifuge three or four times to make sure it has removed as much debris as possible. Some believe centrifuges are the most efficient means of cleaning WVO. By simply increasing the number of passes the oil makes through the centrifuge, they argue it's possible to clean oil to LESS than one micron, which is about as good as it gets. It's also a very easy system to use as typically you turn on the pump and walk away for an hour. Certainly I've found using a centrifuge much less messy than other methods and it's a pleasure to clean the centrifuge after use - at least in comparison to dealing with grungy filter socks. Furthermore filtering WVO by centrifuge takes a fraction of the time it takes to filter by settling alone. So what are the disadvantages of centrifuges? 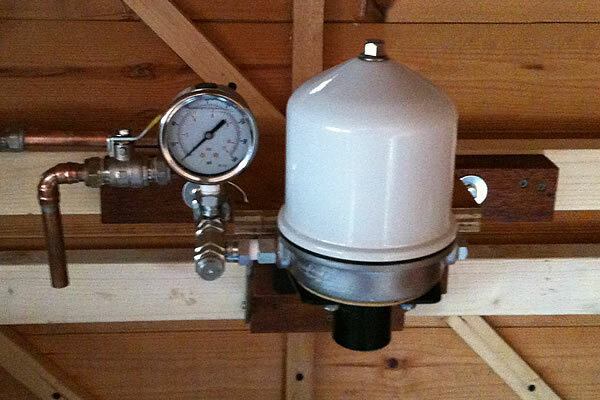 Cost: Beyond a doubt the biggest disadvantage of filtering by Centrifuge is the associated purchase costs. The centrifuges themselves aren't too badly priced. If you shop around you can get a good one for under £100. But there are a lot of extras (gauges, fittings, piping, etc) and the most expensive thing is a pump, coming in at a whopping £300+. Size Restriction: Centrifugues cannot handle large debris, such as batter, animal fats, etc. They would simply clog the centrifuge. Pre-Filtration: Because of the above, some filtering and settling is necessary before you can begin. Animal fats must be removed and the oil filtered to at least 200 microns. Heat: You've got to heat the oil, using those nasty fossil fuels most probably, so some of the greener elements are compromised a little, but obviously it's still beneficial over using diesel. Imprecise: Centrifuges do NOT immediately clean WVO and it's a mistake to think they do. They partially clean the oil each time it passes through them, but multiple passes are required to ensure your finished oil is up to standard. The problem here is that unless you can measure flow rate, you can never really know whether your oil has been cleaned and it's difficult to decide when to stop processing. The only real way to be certain is by cleaning out the centrifuge and trying again, but in many ways that's adding time and inconvenience back in to the equation. In short, it's inefficient. ... does it really clean Waste Vegetable Oil? ... I don't believe so. What? Are You Mad? Everyone Says They're Great! It's critical to understand this... centrifuges might NOT remove animal fats from waste vegetable oil. Because the operating temperature of a centrifuge is around 50 degrees Celsius, any fats liquify. Thus you have runny oil, runny fats and runny water all slushing around together with much the same properties. Possibly it could be argued that water is heavier and may thus separates from the others, but not so the fats. These happily merge back into the oil only to solidify later on when they're cool (possibly in your vehicle if you're not careful). Again, as this is an important topic, I made a YouTube Video on the subject that you may find helpful. I ran my vehicle of oil filtered by centrifuge for a year and then checked my fuel filters... they were quite messy. That's something I hadn't seen before and I consider this proof of my belief... the fats are NOT coming out. If you are hell bent on filtering WVO by Centrifuge, or if you already use a centrifuge and want to improve your results, consider using my advanced centrifuge setup. This combines the benefits of settling with the efficiency of the centrifuge. So again, I personally do not use a centrifuge any more and cannot recommend them, but if you are determined take a look here.